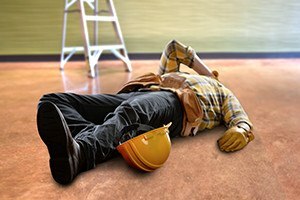 Construction workers know that most job-related falls are preventable. Yet, according to national statistics compiled by the U.S. Department of Labor, approximately 350 construction workers die every year from unprotected falls. These fall-related fatalities represent 40 % of all construction-related deaths. Thousands more are injured in unprotected falls each and every year. If you or a loved one has been injured in a fall at a construction site, it is likely that a government safety regulation was violated. The Washington Industrial Safety and Health Act [WISHA] has comprehensive fall protection safety standards that all contractors are required to follow. When a contractor negligently fails to follow or enforce WISHA safety rules, the injured construction worker may have a third party claim against the negligent contractor. At construction sites all workers who must otherwise be exposed to an unprotected fall hazard of 10 feet or more must be provided with and required to wear a safety harness and line, and the line must be firmly tied off to an anchor point so that any inadvertent fall is arrested. Falls often cause crippling injuries, wage loss, and pain that workers’ compensation benefits paid by the Department of Labor and Industries do not even begin to cover. Just as construction workers are supposed to follow the rules and do a good job, the contractors are supposed to follow the safety rules and do a good job of enforcing those rules. Likewise, construction injury lawyers need to know the safety rules and do a good job of making sure that those who ignored the safety rules and caused a devastating fall injury are held accountable to the injured worker. The attorneys at Kraft Davies, PLLC don’t need on the job training. We know how to build a strong case. When your rights are at stake, you should hire a journeyman and not an apprentice, since you will be paying the same contingent fee to any personal injury lawyer you hire, whether experienced or not. At Kraft Davies, PLLC we know how to properly investigate and aggressively litigate fall injury claims to maximize the financial recoveries that our injured construction worker clients need. We are a Seattle-based law firm, but we represent injured workers from all over the state, in every county and federal court in Washington. If you hire Kraft Davies, PLLC, you will pay us no fee unless we win financial compensation for you! For a free, no obligation consultation, call Kraft Davies, PLLC today at 206.624.8844. Alternatively, you may email your inquiry to us by clicking here.